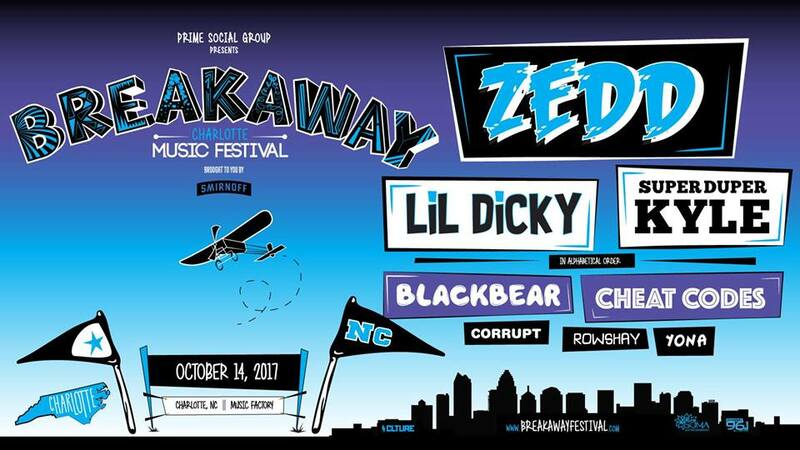 Blackbear, Lil Dicky, Cheat Codes and more will come together on October 14th in Charlotte for the first ever Breakaway Festival. The event will appropriately be held at the NC Music Factory. Headlining the event is German producer Zedd who has played notable music festivals such as Ultra, EDC and Moonrise. Known for top hits like "Clarity" and "I Want You to Know," Zedd brings his electro-house hits to life with pulsating beats and thoughtful production. He is currently traveling for his Echo tour. While Breakaway also takes place in Grand Rapids, MI and Columbus, OH, this is the first time Prime Social Group have chosen Charlotte, largely due to its blossoming music scene. Local favorites from Charlotte, Raleigh, and surrounding areas will also be featured in the silent disco presented by SOMA Entertainment. Devious, DOMii and Freaky are among the local talent that will keep the party going well into the night. This will be the first time the Queen City has seen a music event such as this one. Head on over to the official Breakaway Festival website for more details and to grab those tickets.